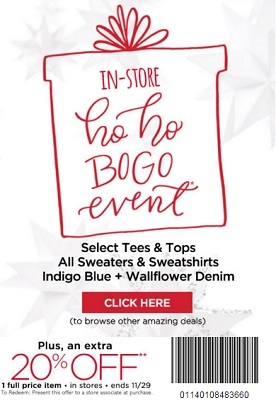 Selected tees, tops, all sweaters, sweatshirts, indigo blue + wallflower denim included in BOGO offer at U.S. Motherhood Maternity stores. Plus, print the coupon and take an extra 20% off one full-priced item. Source of the information is Motherhood Maternity. Offer expires 11/29/2015. More details available at stores.